Seimone Augustus shoots over Brittney Griner in the first half. David Joles/Star Tribune via AP. 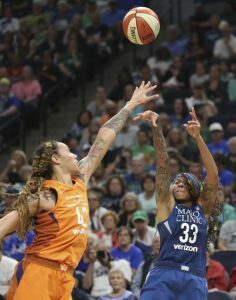 Minneapolis – The Phoenix Mercury’s Brittney Griner and the Minnesota Lynx’s Sylvia Fowles have had their fair share of battles in the paint over the years, including their duel in Friday’s 95-85 Phoenix win over Minnesota. In the most recent match ups, Fowles has had Griner’s number in both the points category, and on the boards. She has been aggressive on both ends of the floor, forcing Griner to put up bad shots and become frustrated. But in their first meeting of this season, it was Griner’s time to shine. The sixth-year center scored 21 points, grabbed nine rebounds and blocked three shots, which put her over the 500-block mark for her career. And her performance helped pace her team toward handing the defending champions a shocking third consecutive loss. Griner didn’t get the quick start she was looking for, taking eight shots in the first half and only converting three of them for nine points. What she was doing better than scoring was challenging Fowles down low, not allowing her to score until 3:16 left in the first half. Griner outworked, out-hustled and outplayed Fowles the first 20 minutes of play, tiring the 11-year veteran out in the second half, which allowed Griner was able to do as she pleased. In the second half alone Griner scored 12 points, making 5-9 shots and adding five more points from the line. Diana Taurasi led all Phoenix scorers with 29 points, while DeWanna Bonner added 24. Maya Moore led five Minnesota players in double figures, with 25 points. It was the first win over the Lynx for the Mercury in 14 meetings. Taurasi started the game with seven of the team’s first nine points, and Bonner had six easy layups in the first two frames. The duo combined for 36 of the team’s 52 first-half points, with Taurasi adding five assists in two quarters that features six ties and 12 lead changes as the teams traded baskets. The two teams battled back and forth in the third quarter, with Fowles beginning to look more like her dominating self and reserve guard Tanisha Wright hitting a couple of big shots, which included a three-point basket to tie the game at 75 early in the fourth quarter. Moore screamed and high-fived assistant coach James Wade as Minnesota forced a shot-clock violation. The momentum had shifted, but only for a second. From there, Taurasi hit two straight three-point baskets of her own, and the Mercury finished on a 20-10 run. The Lynx players held their heads as the team walked off the court with a 2-4 record and three straight road games looming. Taurasi’s improvement in scoring has been positively correlated with something she is doing off the court. She started doing yoga and meditating and says that has helped her improve her mindset. While the cheering and celebrating could be heard outside Phoenix’s locker room postpgame, the complete opposite could be said about the Minnesota locker room just down the hallway. Moore, usually so full of energy and excitement following most games, seemed upset and distraught. Reserve guard Danielle Robinson faced her locker as media surrounded locker neighbor Lindsay Whalen, and Robinson didn’t turn around. Whalen was lost for the right words – something that is a rarity for the veteran. 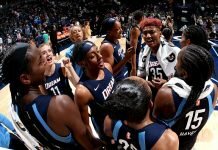 The theme of not comparing this season to years previous was heard throughout the Lynx locker room on Friday night as well as the day before on Cheryl Reeve’s podcast that she does with the Talk North Podcast Network. 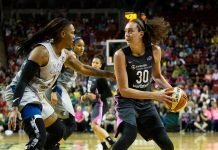 Struggles seem to come to a head in the fourth quarter, as Lynx players have looked gassed and unable to put together stretches of defense to contain their opponents. Runs by those opponents early this season have put Minnesota in a desperate position where they have to play from behind, something the core group of players isn’t used to doing over the eight years, in which they have won four titles. The Lynx leave tomorrow on a three-game road stretch that could be the toughest of the season. They begin Sunday with a match up against arch rival Los Angeles, to whom they suffered their first loss of the year. From there they travel to Washington D.C. to face the 5-2 Mystics, after which they head to Connecticut to take on the undefeated, red-hot Sun. Moore said Minnesota players know that their roster has several new faces this year, and that they need to come together. T’was the night before March Madness………..